I know more about the background of this book than I usually do because the edition I read had a foreword by David Lodge. He’s one of my favorite writers-about-literature, so I actually read what he had to say, although not of course until I had finished the book. And I’m glad I did; not only did his thoughts and comments enrich my understanding, but his at-first baffling description of a key scene made me realize that I had accidentally turned over two pages at the end of a chapter, thereby missing one of the best passages in the book. Anyway. 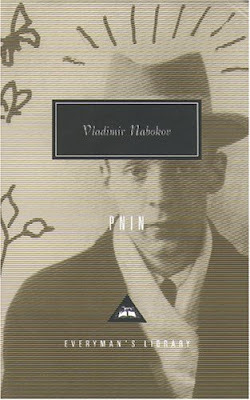 Pnin is an early entry in the campus comedy genre, a portrait of an eccentric professor of Russian written in seven discrete, episodic chapters. 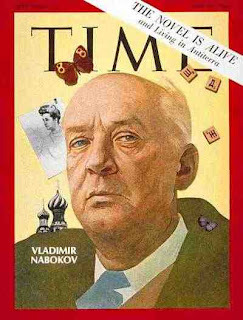 From the foreword, I learned that Nabokov wrote the book in a series of short stories that were first published in the New Yorker before being appearing together as a novel. Yet despite this, and despite that the individual episodes vary widely in tone and theme, this is no collection of short stories. The novel is in fact tightly interwoven, with mysteries from the opening page that aren't cleared up until the final chapter, and a florid abundance of subplots that gently progress over the course of the narrative. Much of the primary plot, the “story,” happened long before the rather quotidian events described in the book, and is only gradually uncovered and discovered through fragmentary references to the past. I don’t think I’m going too far out on a limb to describe Pnin as a kind of Cubist portrait, in which we see a single life from all sorts of angles simultaneously – or at least as "simultaneously" as you can burn through 130 pages (it’s short!). This being Nabokov, Pnin is chockablock with erudite wordplay that is positively Nabokovian, and I say this in every confidence that two-thirds of it went straight over my head. But it ain’t all highbrow stuff, either. There’s plenty of making fun of how our hero, the eponymous Professor Timofey Pnin, talks funny, and there’s a long scene that relies on the sitcom device of him thinking he’s talking to one guy when he’s actually talking to somebody else. The opening scene, in fact, is a long shaggy dog story about how Pnin has got on the wrong train and hasn’t figured it out yet, ho ho ho! It’s not likely to have you in stitches, but Nabokov has the comic timing to make it all work. Now if you’re like me, you are fascinated by the way that the nature of the narrator structures a work of literature, amIright? And in this regard, Pnin is positively over the top. From the first sentence, Nabokov introduces an ambiguity as to whether the story is being told by a garden variety omniscient implied narrator or by a specific but unnamed storyteller within the world of the novel. But as we start to get comfortable with the omniscient narrator, who after all constantly remarks on Pnin’s thoughts and feelings, the unnamed storyteller will suddenly pop up and assert himself, remarking offhandedly for instance that someone who Pnin knows is a mutual acquaintance. As the book continues, these intrusions get more and more frequent until, by the last chapter, the narrator is writing in the first person and is the active party, Pnin himself still at the center of attention but as the object of someone else’s observation. (And just to put the cherry on the cake, Lodge tells us that Nabokov drops numerous biographical hints that the narrator is, in essence, real-life Nabokov.) I don’t recall seeing anything quite like it before, and no wonder; this kind of writing requires a technical virtuoso. Well, in most of the chapters, Professor Pnin is a fairly pathetic figure. His research is silly, he’s a poor teacher, and he talks funny. He’s not well-integrated into American culture, his personal life is lonely and unhappy, and he is petty, selfish, and vain. If he stayed in this one mode to the end of the book, he would be pretty hard to take. But, there are surprises waiting that add a great deal of depth to the novel. On a weekend road trip, Pnin gets himself lost on country roads through his foolishness and vanity – but then, suddenly, reaches his destination, a country house where he is staying for the weekend with several of his fellow expatriates, intellectuals who fled the Bolsheviks and then the Nazis before washing up in alien North America. Among his own kind, the ridiculous Dr. Pnin is suddenly revealed as an intelligent, sensitive, even urbane man with more subtleties and sorrows than anything we have seen of him on campus. A few chapters later, he hosts a party for his handful of campus friends, and although he is still a bit of a buffoon in this setting we can also see that he is a humane figure who is playing a tough deal as best he can. So Pnin is funny, but darkly funny. It’s witty but spare. It’s a lot of fun for readers who like to put some work into their fun. Remember that this is a campus comedy, and one of the early entries in the now-common genre. And, although professorial politics is a pretty broad target, it's a target that Nabokov hits repeatedly and with considerable deftness. Two interesting characteristics distinguished Leonard Blorenge, Chairman of French Literature and Language; he disliked Literature and he had no French. This did not prevent him from traveling tremendous distances to attend Modern Language conventions, at which he would flaunt his ineptitude as if it were some majestic whim, and parry with great thrusts of healthy lodge humor any attempt to inveigle him into the subtleties of the parley-voo. Hagen… suggested Pnin could teach a French Language course: like many Russians, our friend had had a French governess as a child, and after the Revolution he lived in Paris for more than fifteen years. Hagen, who was well aware of Blorenge’s special requirements, hesistated. ‘I repeat, he can adapt himself,’ hedged Hagen. ‘I’m afraid he does,’ said Hagen with a sigh. ‘There still remains Advanced French,’ murmured Hagen. ‘Carolina Slavski and I take care of that,’ answered Blorenge. If you are chuckling at this point, you need to go out and get you some Pnin. If you are profoundly unamused, then this is not the book for you. If you’re somewhere in between, you may proceed on your own judgement. See, maybe that's the difference between our readings right there. It could be the year I've had, but that scene struck me as pretty unfunny. And I like to put some work into my fun! ...whereas I have probably spent a combined half hour just delighting in every last detail of the phrase "parry with great thrusts of healthy lodge humor any attempt to inveigle him into the subtleties of the parley-voo." 'Carolina Slavski and I take care of that.' HOOT!!! I hadn't realized you started reading (more?) Nabokov until your Pale Fire post. Your treatment of Pnin is wonderful - and I agree, it's one of the more enjoyable pieces I've ever read. I've got no connection with academia yet saw the politics and satire riotously funny and insightful into a sphere I barely know. I was about to riff on autobiographic references through VN's work, but am clearly not qualified to take it too far. In the end, I'm more a fan of his wordplay and the power of his complex, multidimensional narrative. If you've not read them yet, going back to his early works from the 1930's (published in English in that decade too), such as "Laughter in the Dark" and "Despair", are a joy. It's much like reading early Joyce and Fitzgerald as compared to their later works (not that they're comparable to each other in my mind).